Imagine the daily routine of a cat that lives in the wild. What do you imagine this cat is doing all day? A typical day in the wild is spent hunting for food, marking one’s territory, defending that territory, hiding from predators, grooming and resting. All of these activities take a lot of physical and mental energy - cats need rest to stay sharp. Compare the daily routine of a cat in the wild to that of a typical domesticated indoor cat and you will find significant differences. In an indoor environment, a cat may be fed 2 or 3 times per day, or have access to its food at all times, rather than having to hunt for 10-20 small meals per day in the wild. Cats may have access to one or several litter boxes in the home where their owner would like them to use the bathroom. There are typically no significant predators, except for the overzealous canine housemate, who is likely more of an annoyance than anything else. Competition for resources is minimal, especially if there are only one or two cats in the household. With all of these differences, we might think that the indoor cat has all of its basic needs fulfilled. This cat has plenty of food and water, a roof over its head, areas to use the bathroom and rest. What about all of the mental and physical stimulation that cats require? This consistent engagement and stimulation is commonly missing from the indoor cat’s life and it can be a significant cause of a terrible condition: “Boring Life Syndrome”. While the name of this syndrome is made up, the concern is real. The lack of engagement in the daily lives of indoor cats can lead to any number of problems, such as over-grooming, chewing inappropriate items and over-eating. To provide a truly enriching environment for our indoor cats, we must think about how to provide resources and activities that mimic what they would naturally do in the wild. If we can do this well, then we will have the best of both worlds; the safety and consistency of an indoor environment and the engagement and fulfillment of the outdoor environment. Offer multiple small meals per day, rather than 1 or 2 large meals. Hide these meals around the house or place small amounts of food in a puzzle feeder to encourage activity while fulfilling the primal urge to hunt. 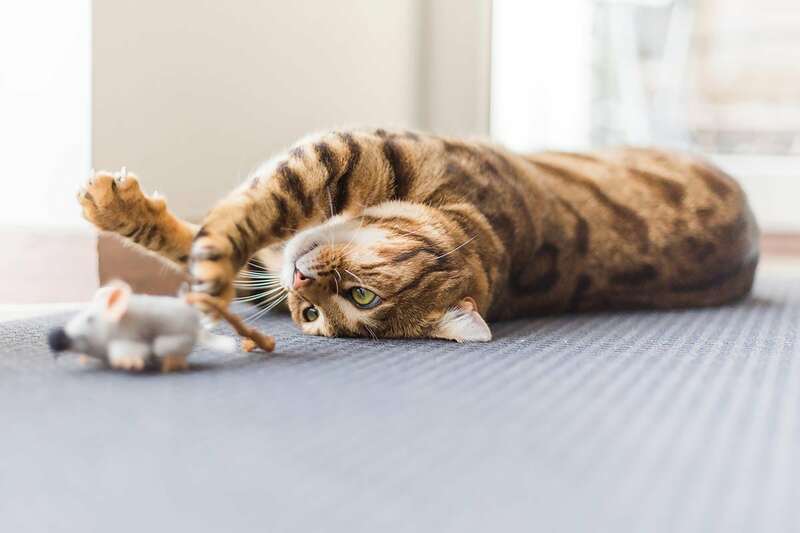 It is important to incorporate small sessions of play into your feline friend’s day. Try something that they can chase, and then grab ahold of and sink their teeth into at the end of the activity. This will mimic hunting in the wild while burning calories and increasing mental engagement. Each cat is different, “play” around with what toys your cat enjoys the most and mix it up over time. Provide enough litter boxes! A basic rule of thumb is “n + 1”. If you have 1 cat, you should have at least 2 litter boxes in your home. If you have 3 cats, you should have a minimum of 4 litter boxes in your home. Ideally, a litter box should be located on each level of your home for easy access. This becomes particularly important if you have a geriatric cat. Clean your litter boxes daily! We want our cats to use the same litter box each and every time in our home. Our best bet for consistent success is to provide enough litter boxes and keep those boxes as clean as possible. Scratching is a normal cat behavior. It helps cats mark their territory, both visually and via pheromones that are left behind on the objects they scratch. Scratching is also a great way for cats to stretch their muscles by reaching well up onto a vertical surface such as a tree trunk to leave their mark. Offer both vertical and horizontal oriented scratching posts. Pay attention to which type of orientation and which surface textures your cat prefers the most. When it is time to rest, cats like to have a place that is comfortable and safe. You may find that some of your cat’s favorite areas to nap are under the bed or on the back of the couch with some sunshine warming their body. You can create ideal resting places by providing a comfortable spot in a quiet, undisturbed area of your house. Elevated perches are ideal areas for your cat to catch a view of the world around him or her. For some cats, these elevated perches may also be one of their favorite spots to hunker down and catch a few Z’s. To recap, there are two basic concepts to remember when providing an optimal environment for our feline friends. Keep your cat actively engaged throughout their daily routine with enriching activities. Cats enrich our lives – let’s enrich theirs! Renal K+ potassium supplement supports normal kidney health in cats and dogs.